This article is about the region in the southwestern United States. For the monument in this region at the corners of the four states, see Four Corners Monument. For other uses, see Four Corners (disambiguation). The Four Corners region is the red circle in this map. The Four Corners states are highlighted in orange. Bluff, Utah and Comb Ridge from the air. 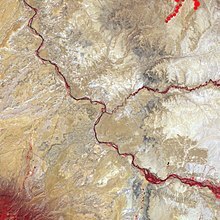 The Four Corners is a region of the United States consisting of the southwestern corner of Colorado, southeastern corner of Utah, northeastern corner of Arizona, and northwestern corner of New Mexico. 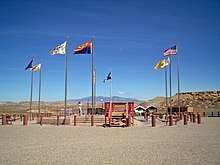 The Four Corners area is named after the quadripoint at the intersection of approximately 37° north latitude with 109° 03' west longitude, where the boundaries of the four states meet, and are marked by the Four Corners Monument. It is the only location in the United States where four states meet. Most of the Four Corners region belongs to semi-autonomous Native American nations, the largest of which is the Navajo Nation, followed by Hopi, Ute, and Zuni tribal reserves and nations. The Four Corners region is part of a larger region known as the Colorado Plateau and is mostly rural, rugged, and arid. In addition to the monument, commonly visited areas within Four Corners include Monument Valley, Mesa Verde National Park, Chaco Canyon, Canyons of the Ancients National Monument and Canyon de Chelly National Monument. The most populous city in the Four Corners region is Farmington, New Mexico, followed by Durango, Colorado. Air service is available via the Durango-La Plata County Airport in Durango, Colorado, Four Corners Regional Airport in Farmington, New Mexico, and Cortez Municipal Airport in Cortez, Colorado. 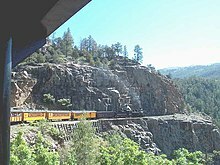 Interstate 40 passes along the southern edge of the Four Corners region. The primary U.S. Highways that directly serve the Four Corners include U.S. Route 64, U.S. Route 160 (which serves the Four Corners Monument itself), U.S. Route 163, U.S. Route 191, U.S. Route 491 (previously U.S. Route 666 ), and U.S. Route 550. ^ a b "Four corners Monument". Navajo Nation. Retrieved 2016-12-06. 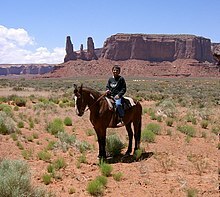 ^ a b "Welcome to the Navajo Nation". Navajo Nation. Retrieved 2016-12-06. ^ "Four Corners PID AD9256" ( text file). NGS Survey Monument Data Sheet. United States National Geodetic Survey. 2003-05-07. Retrieved 2007-01-15. ^ Ward, Kathleen. "Rainmaker, Go North – Nebraska Needs Help, Too". Kansas State University Research and Extension. Archived from the original on September 12, 2006. Retrieved 2008-05-08. ^ a b Arizona Road and Recreation Atlas (Map) (2004 ed.). 1:400,000. Benchmark Maps. 2004. § D3. ISBN 0-929591-84-4. ^ "Ute Mountain Ute Indian Reservation" (PDF). U.S. Department of Energy. Archived from the original (PDF) on 2008-06-26. Retrieved 2008-05-11. ^ "Four Corners Indian Tribes". Farmington, New Mexico Convention and Visitors Bureau. Retrieved 2016-12-06. ^ "Ute Mountain Ute Tribe – Overview and Statistics". Ute Mountain Ute Tribe. Retrieved 2008-05-11. ^ a b "Four Corners Area Map". Farmington, New Mexico Convention and Visitors Bureau. Archived from the original on September 24, 2007. Retrieved 2008-05-08. ^ "Google Maps". Google using data from Navteq. Retrieved 2008-05-08. ^ Richard F. Weingroff. "U.S. 666: Beast of a Highway?". ( USDOT – FHWA). Retrieved 2007-11-17. Wikimedia Commons has media related to Four Corners, United States.